Along with Algonquin’s diversity in habitats comes an associated diversity in plant and animal life. 53 species of mammals, 272 species of birds, 31 species of reptiles and amphibians, 54 species of fish, and approximately 7000 species of insects are known to occur within Algonquin’s boundaries! In addition, there are well over 1000 species of plants and another 1000 plus species of fungi growing in the Park! With such a huge diversity of living things it is not surprising that many people are drawn to Algonquin Park to catch a glimpse of a wild animal or to drink in the beauty of a spring wildflower. Much of what we know about Algonquin’s plants and animals has been learned through scientific research. A tremendous amount of scientific research has taken place in Algonquin Park over the years, and the Park continues to provide an important area for biologists and ecologists. Much of this research has taken place at the Wildlife Research Station located along the Highway 60 corridor. 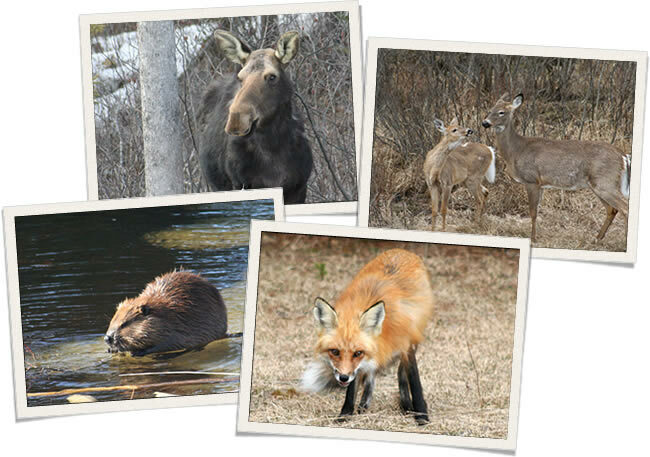 Wildlife viewing Do’s and Don’ts Brought to you by Algonquin Park. We cannot tell you here how to go about seeing all of Algonquin’s wildlife species but we can give some pointers on increasing your chances of viewing wildlife during your stay in the Park. 2. DO take a pair of binoculars. They are almost always indispensable when looking at birds and, even with large mammals, they can’t help but greatly improve the experience. 3. DON’T imagine that the “real wildlife viewing” is to be had only on canoe trips away back in the park Interior. As a matter of fact, far more wildlife is seen each year right along Highway 60 than in all of the Interior put together. Some animals (particularly moose) are actually attracted to the highway at certain times of the year. More important, however , is the fact that canoeists are slow moving and often out in the middle of lakes, far from any animals that might be at the shore. Motorists on Highway 60, on the other hand, are much more mobile and more likely to see animals close up. Cruising the highway with a careful eye out for animals standing at the edge of the bush, especially early in the morning or just before sunset, can be a very good way of seeing wildlife. Please remember to pull onto the shoulder, safely off the pavement. 4. DO concentrate on low lying wet areas such as bogs, beaver ponds and meadows. These places are the preferred habitat of many wildlife species and they often provide open vistas or breaks in the otherwise thick forest. For this reason alone they make for excellent wildlife viewing. Some of the interpretive trails along Highway 60, such as the Beaver Pond Trail, the Spruce Bog Boardwalk, and particularly the Mizzy Lake Trail which was specifically designed for wildlife viewing, take advantage of this fact and are excellent places to try – especially since you don’t have to get your feet wet. No visit to Algonquin Provincial Park would be complete without a stop at the Visitor Centre at km 43. Just inside the East Gate, the Algonquin Logging Museum brings the story of logging to life from the early square timber days to the last of the great river drives. Algonquin is blessed with a vast interior of maple-treed hills, rocky ridges, and thousands of lakes. The only way to explore the interior of this park is by canoe or on foot.